By Hamad Ghazle, Ed.D, APS, RDMS and Shweta Bhatt, M.D. Acute scrotal pain requires prompt diagnosis for appropriate treatment. Often times, the differential considerations include infection versus torsion in the absence of trauma. 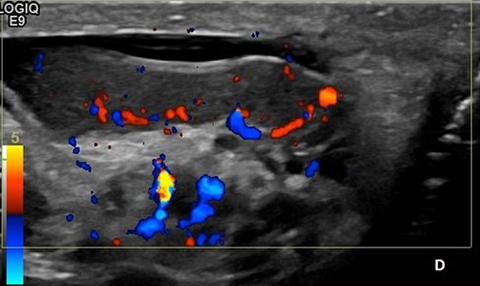 Ultrasound is the modality of choice for evaluating the scrotum. Because of the continuous improvement in the ultrasound technology and increasing experience, sonographers, radiologists, and clinicians can often distinguish between different diseases with greater certainty when vascular hyperemia, edema, and distinctive echotextures are observed on both gray-scale and color Doppler sonography. 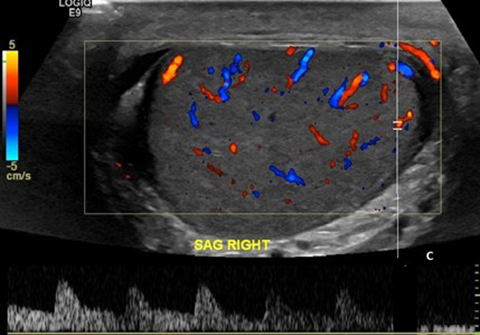 Given the continued improvement in sonographic technology and the superior resolution and sensitivity of color and spectral Doppler sonography, the visualization and characterization of scrotal contents is now more advanced. Acute epididymitis should be suspected at sonography when the epididymis is enlarged, edematous, and hypervascular. These sonographic characteristics assist the sonographer and physician in establishing the correct diagnosis, while excluding differential considerations, such as orchitis and testicular torsion. Prompt and accurate diagnosis is necessary to expedite appropriate treatment and avoid complications. Yagil Y, Naroditsky I, Milhem J, et al. Role of Doppler ultrasonography in the triage of acute scrotum in the emergency department. J Ultrasound Med 2010; 29(1): 11–21. McAndrew HG, Pemberton R, Kikiros CS, et al. The incidence and investigation of acute scrotal problems in children. Pediatr Surg Int 2002; 18: 435-437. Redfern TR, English PJ, Baumber CD, McGhie D. The aetiology and management of acute epididymitis. Br J Surg. 1984; 71(9): 703–705. Manavi K, Turner K, Scott GR, Stewart LH. Audit on the management of epididymoorchitis by the Department of Urology in Edinburgh. Int J STD AIDS. 2005; 16(5): 386–387. Kass EJ, Lundak B. The acute scrotum. Pediatr Clin North Am 1997; 44: 1251-1266. Dogra VS, Gottlieb RH, Oka M, Rubens DJ. Sonography of the scrotum. Radiology 2003; 227(1): 18–36. Lee JC, Bhatt S, Dogra VS. Imaging of the epididymis. Ultrasound Q. Mar 2008; 24(1): 3-16. Pavlica P, Barozzi L. Imaging of the acute scrotum. Eur Radiol. 2001; 11(2): 220-228. Dogra VS, Rubens DJ, Gottlieb RH. Torsion and beyond: new twists in spectral Doppler evaluation of the scrotum. J Ultrasound Med. 2004; 23(8): 1077-1085. Cook JL, Dewbury K. The changes seen on high-resolution ultrasound in orchitis. Clin Radiol 2000; 5: 13-15. Ghazle H, Bhatt S. Acute Testicular Pain. J Am Osteopath Coll Radiol. 2014;3(4):25-28. Hamad Ghazle, Ed.D, APS, RDMS and Shweta Bhatt, M.D. Dr. Ghazle works with the Diagnostic Sonography Program, Rochester Institute of Technology and Dr. Bhatt works with the Department of Imaging Sciences, University of Rochester both in Rochester, NY.